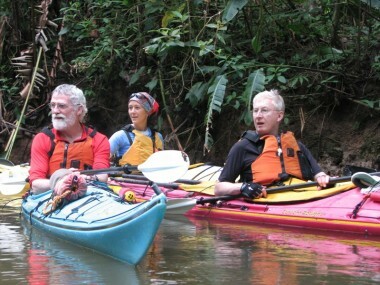 Seascape has been offering unique, small-group sea kayaking experiences on the Pacific coast of Costa Rica since 1996. Come visit us between October and April every year. Bienvenidos and Welcome! The new season is underway in Costa Rica. Imagine paddling in crystal clear water, snorkeling just off a white-sand beach, and catching a glimpse of sea turtles, laughing at playful monkeys and gliding right by huge pelicans. You can experience all this on a Seascape trip at Curu Wildlife Refuge, a small wildlife preserve and national park on the southern tip of the Nicoya Peninsula. This location provides easy access to the park’s extensive system of hiking trails, the crystal clear waters of the Pacific, several beautiful beaches, a mangrove estuary, excellent snorkeling, the Tortuga Islands and incredible wildlife, including sea turtles, monkeys and Scarlet Macaws. In addition, Seascape now offers Sunrise and Sunset tours from its new Southern base of operations, the intimate, boutique hotel Tambor Tropical, just 20 minutes from the Curu Wildlife Refuge. We would love for you to join us for a paddling experience in paradise this winter. Unique lodge – based and camping itineraries are available from November to April on both Pacific and Caribbean coasts. Trip times and schedules can be customized to fit your needs and fulfill your dreams for the perfect vacation. Feel free contact us for more details about our trips. Our day trips can be customized to fit your schedule. Let us know the dates and times you would like to do your trip, and we will do our best to accommodate you. Enjoying the water for the greater part of a day allows you to immerse yourself in the warmth and tropical beauty of the Pacific. Paddling in water so clear you can often see to the bottom allows you to experience every facet of this dynamic ocean environment in a very personal way. Sea turtles are commonly sighted and a full gourmet lunch is served in the shade of palm trees on the beach. Time for snorkeling or a short birding hike is often incorporated into the full-day experience. A half-day adventure can be the perfect introduction to marine life you simply can’t experience on shore. A variety of seabirds are commonly sighted and the tour includes a fresh fruit break in the shade on the beach. The time of your departure can often be tailored to your particular schedule. Guests of Tambor Tropical in the quaint sunny village of Tambor can now enjoy Sunrise or Sunset tours right at their accommodation. Sunrise tours feature coffee before and after the trip; Sunset tours are often followed with a chilled glass of wine. A true paradise for sea kayaking, the Reserva Curu on the Nicoya Peninsula is the point of departure for amazing adventures and coastal explorations into the Gulf of Nicoya. Our five-day sea kayak expedition takes you into the heart of “the dry coast” and allows you to encounter marine and terrestrial wildlife you can only experience by truly immersing yourself in the tropical life. A true paradise for sea kayaking, the Reserva Curu on the Nicoya Peninsula is the point of departure for amazing adventures and coastal explorations into the Gulf of Nicoya. Our three-day sea kayak expedition, a shorter version of the Islas trip will provide you with a real sense of place and feel for the this unique tropical ecosystem. Kayaking in the clear waters of the Pacific Ocean promotes a sense of peace and well-being, both physical and spiritual. The practice of yoga offers many benefits, from increased flexibility and strength to a deeper sense of connection with the world around us. 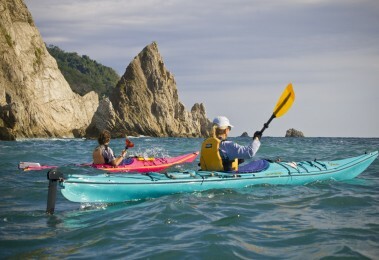 It is therefore a natural fit to combine sea kayaking with yoga. This trip in the warm, tropical setting of the Nicoya Peninsula, Costa Rica, is open to paddlers and yoga enthusiasts at all levels of experience. More information on the KaYoga page. Contact us via e-mail to discuss dates you have in mind. Be part of a small group exploratory paddle in one of the wildest places on the planet! National Geographic ranked the Osa Peninsula as “one of the most biologically intense places on earth”, and Jacques Cousteau called its magnificent Golfo Dulce (sweet gulf) the most pristine of the world’s four tropical fjords…This 3-part adventure starts in the open Pacific surrounding Drake Bay, followed by the tranquil and pristine Golfo Dulce, and finally in the biodiverse rainforest of the Osa Peninsula. If you’ve dreamed of a sea kayaking and hiking experience in one of the world’s most remarkable places then this could be the adventure you’ve been longing for. This adventure takes place within the serpentine canals and lagoons of Tortuguero National Park on Costa Rica’s Caribbean Coast. The park consists of 46,000 acres, including ocean reserve, and represents one of the best examples of rainforest in Central America. 400 bird species and 16 endangered mammal species including Manatee and Jaguar are found within park boundaries. Kayaks provide an intimate way to explore this unique rainforest ecosystem by day, and park lodges offer the essential creature comforts at night. This trip can be customized to include a special Turtle Twilight experience during which paddlers spend one night of their trip volunteering to help conserve sea turtles. 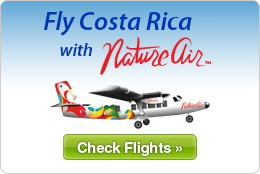 This itinerary provides the best of both worlds — a chance to experience Costa Rica’s eastern and western coastal environments in two weeks. Starting in San José, this trip moves first to a mountain resort near the Turrialba Volcano for the night, and then we continue east across the country into the Caribbean Rainforest. We will spend four days and three nights exploring Tortuguero National Park on the Caribbean Coast, paddling through the canals and lagoons during the day and enjoying the comforts of lodge accommodations at night. Next the group transfers back to San José for a short afternoon flight to Tambor on the Nicoya Peninsula, Pacific coast.The group will be based at the boutique hotel Tambor Tropical. Three days are then spent exploring the warm, lucid waters of the Pacific Coast. We will transfer back to San José for the final night before departure. 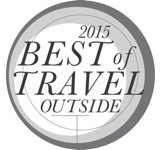 Prices for multi-day trips include all land-based transportation and most accommodations. PRICES LISTED ON THIS PAGE ARE PER PERSON IN US CURRENCY. APPLICABLE TAXES ARE EXTRA.